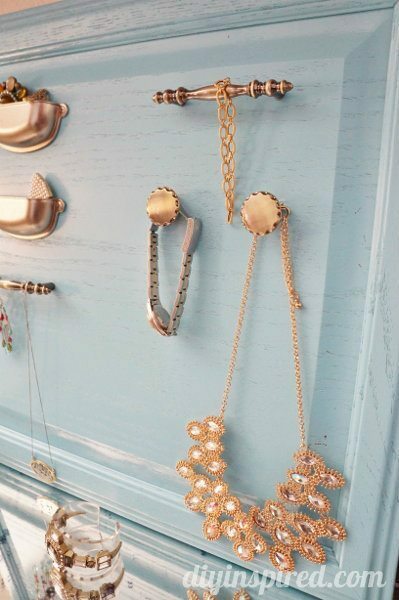 For some reason if my jewelry is displayed, I wear it more… probably because it’s right there for me to see and choose from, as opposed to a hanger in between my clothes that I forget about. 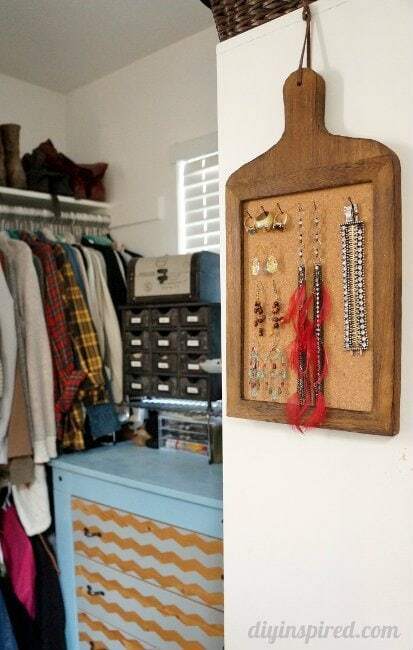 I realized today that I had created several organization and storage options for my jewelry in my walk-in closet so I thought I’d share it today. 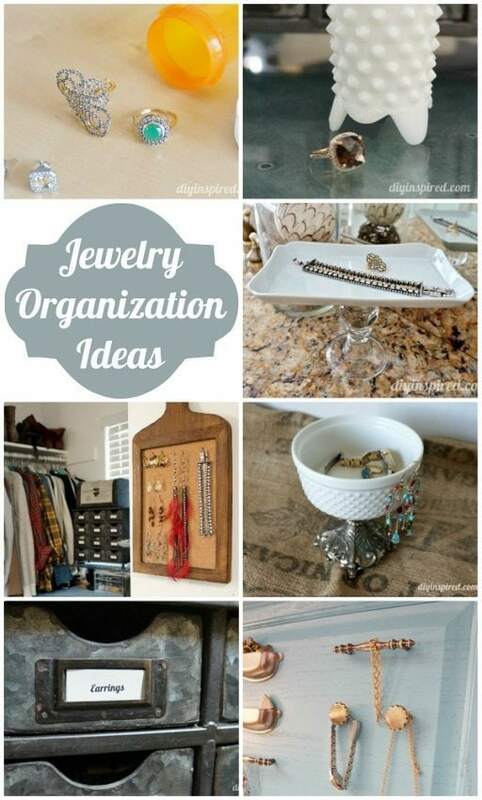 Hope you find these repurposed jewelry organization ideas inspirational and useful! Let’s start with something new; one that I have never posted before. I got this cute corkboard for Christmas this year as a white elephant gift. I stared at it for days, because I didn’t really need it in the kitchen. Here’s what I ended up doing with it. The earrings hung nicely, and I used little nails to hang the bracelet and rings. 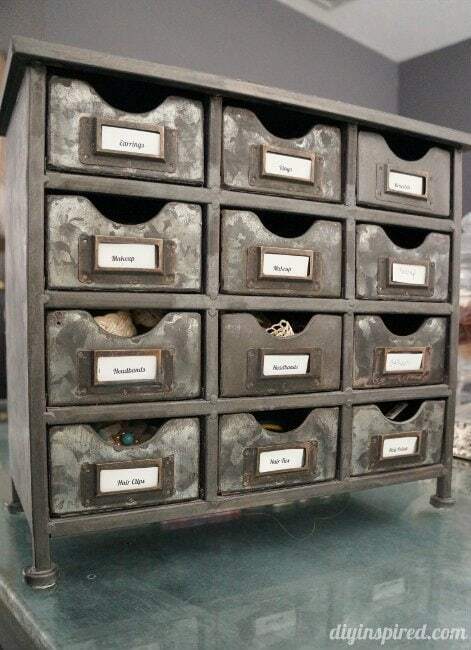 I found this cute metal chest of drawers at Hobby Lobby. 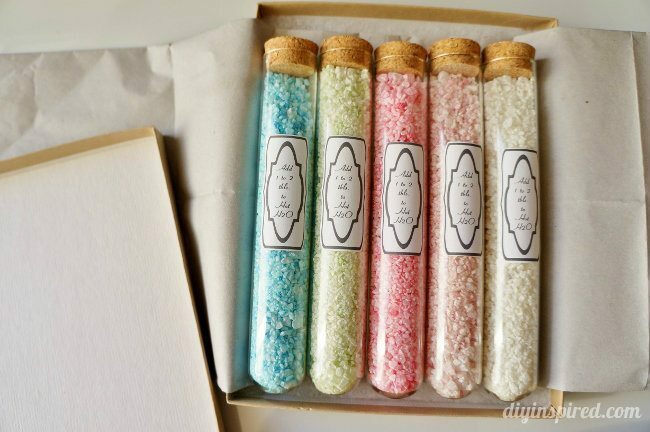 I made little labels and use it for jewelry, hair accessories, and makeup. This is a little antique shopping vintage find I HAD to have. I use it for rings that I wear all the time. 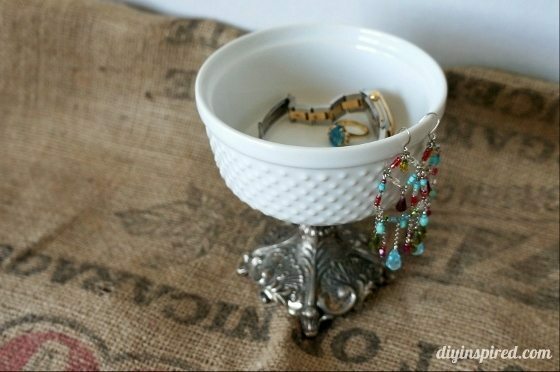 To match this little ring holder, I made this repurposed pedestal bowl out of some thrift store finds. 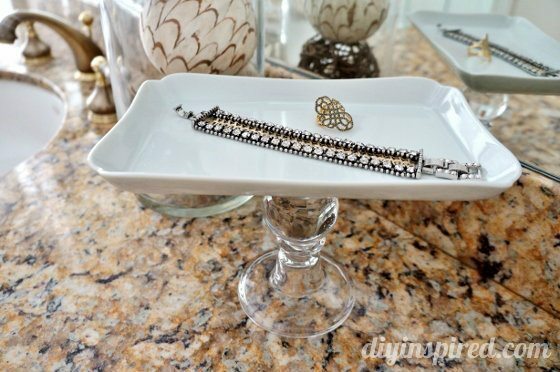 I also made this DIY pedestal tray from thrift store finds. 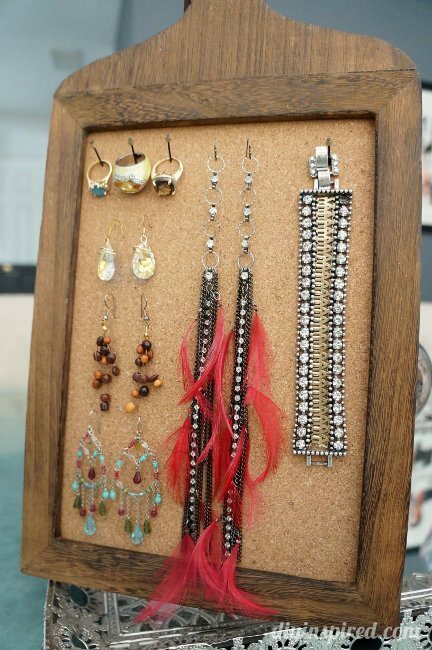 This was an old cabinet door that I repurposed into a jewelry display with some knobs and drawer pulls. 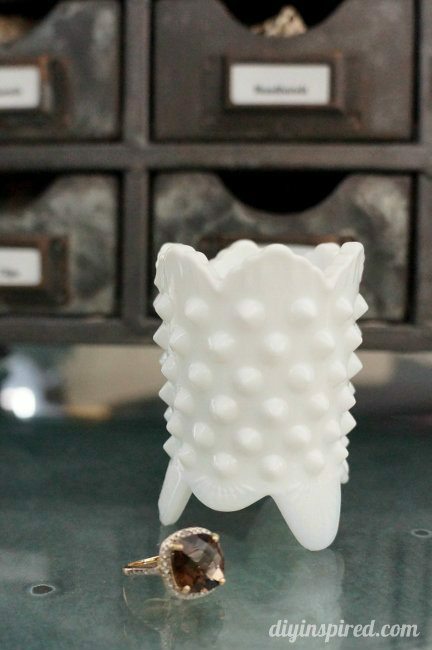 Lastly, since my husband and I travel often, I keep prescription bottle handy to put my jewelry in while we travel. 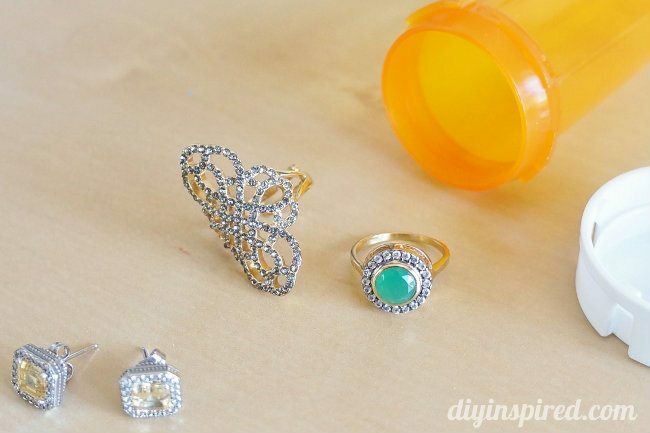 Here are some more repurposed prescription bottle ideas. Thank you so much, Magdalena! Thank you Almeera! 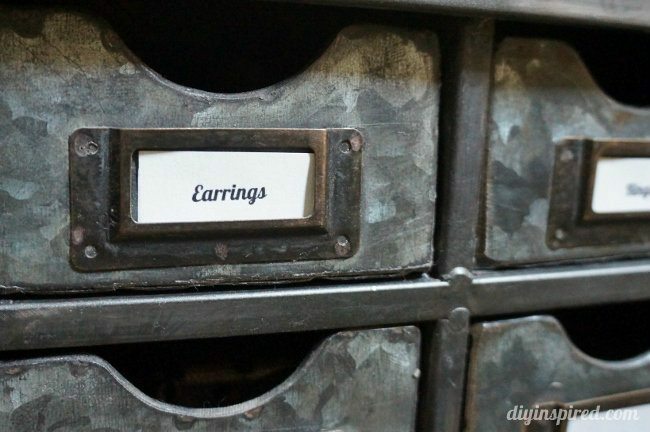 It’s so perfect for earrings! I love reading about all your ideas. 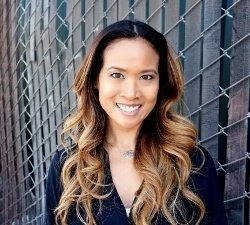 I have followed your blog since Lauren. S. Pointed it out to a few years ago. 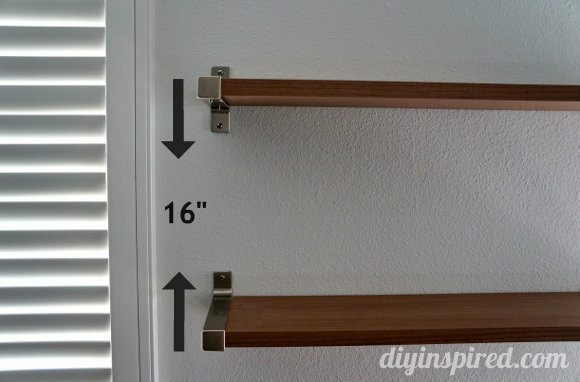 I am reusing a kitchen pantry in a laundry/pantry room. We have removed all of the inside shelves and turning it into a free standing linen closet. One side of the pantry is exposed and I would like to turn that into a large magnetic chalkboard for our little granddaughter. I found vintage block letters for wordplay games, but not sure what is the best chalkboard paint to use. What is your experience with chalk board paint? Hi Christi! Thank you so much! I’m so glad you like it. I do love chalkboard paint. 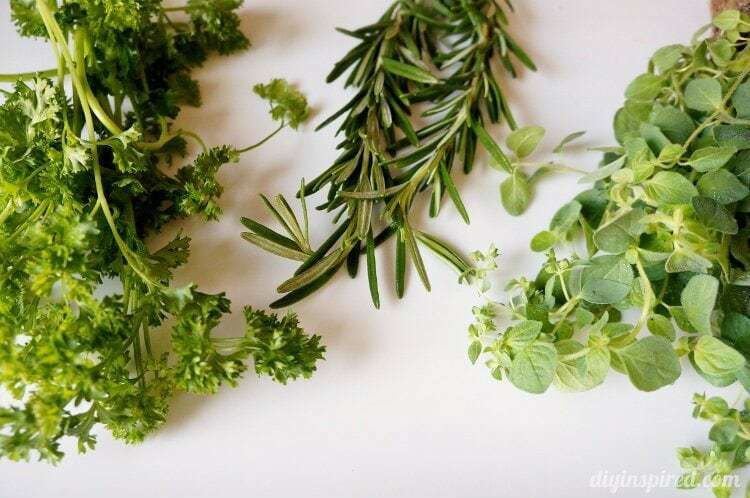 I have tried several, and I do love Martha Stewart’s the best. When I use it, I apply three coats, but I wait 2 hours in between coats and then after the last one, I wait 24 hours to use it. I’ve never had an issue with it and it works on many different surfaces. I hope this helps!